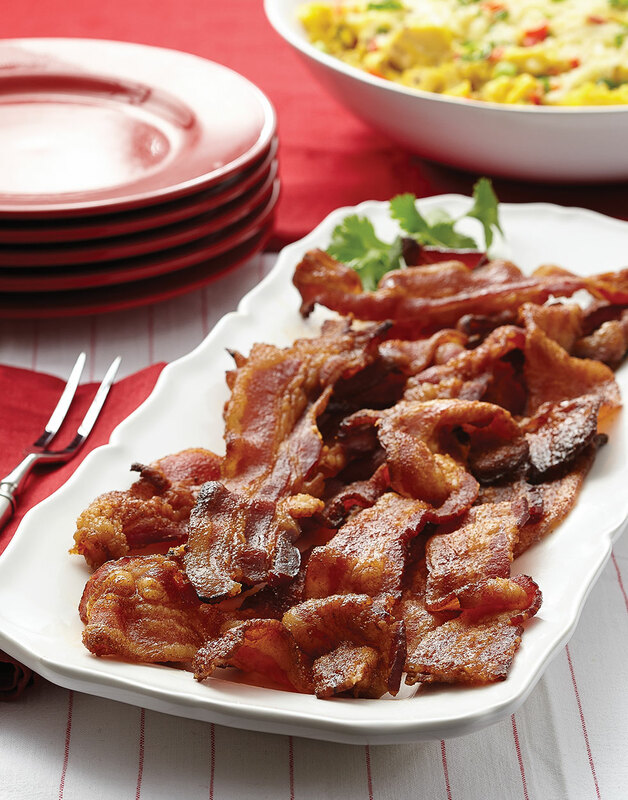 Sweet & Spicy Oven-Baked Bacon is the perfect side dish for breakfast. The smells alone will have everyone gathering in the kitchen waiting for the timer to go off. But make sure to keep an eye on the bacon while it cooks — the sugar can cause it to burn somewhat quickly. After arranging bacon on the prepared baking rack, cover and refrigerate overnight. Uncover bacon before baking. Line a baking sheet with foil, then top with a wire rack. Combine sugar, cumin, coriander, and cayenne. Rub sugar mixture evenly into both sides of bacon strips. Arrange bacon on prepared baking rack. Bake bacon to desired crispness, about 45 minutes. (Bacon will crisp slightly as it cools.) If bacon seems to be getting too dark, tent with foil after 30 minutes. Transfer bacon to a paper-towel-lined plate. Cooking bacon on a rack helps it cook evenly because it allows the air to circulate and the fat to drip down.